As the spring gets under way, Three Cornered Copse is starting to look at its best. 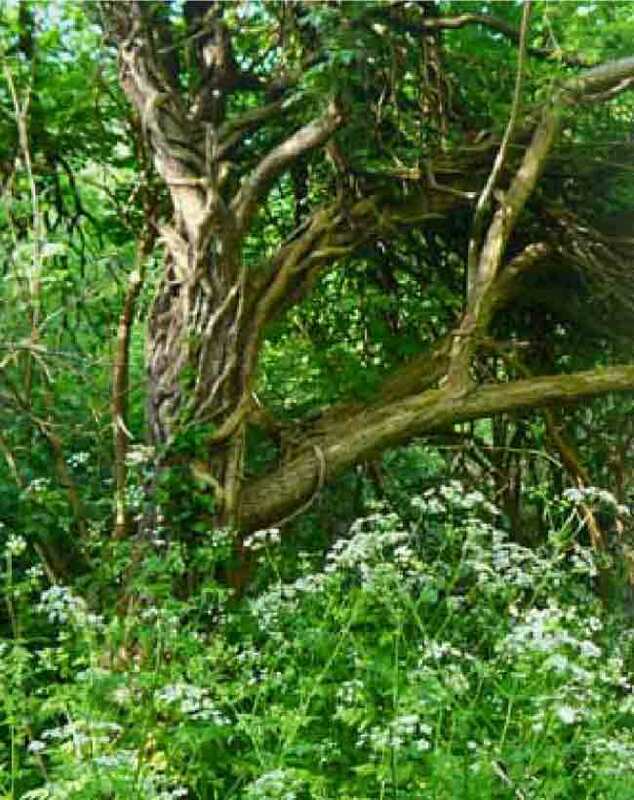 The cow parsley stands tall, and is in blossom, sending a buttery, toffee scent to permeate the woodland, when the air is still and the foliage is at its best. There is still plenty of sunlight penetrating the higher woodland, and those of us brave enough to rise at dawn would be deafened by the birdsong that echoes through the green canopy. As the trees begin to look their best, the diversity of species in the copse becomes more evident. There is mainly beech, with many elms and birch trees, together with the ubiquitous sycamore and alder, and there is a small, but persistent, population of yew trees, particularly on the higher slopes of the woodland. You'll find the yew trees hidden amongst the denser parts of the wood, distinctive with their dark green needles, growing on two sides of each branch. The yew is rich in mythology and history, often planted, and found, in graveyards, some say to sanitise the buried plague victims, but often many years old. In Wakehurst Place recently, a yew was discovered which dated back to mediaeval times. It's unlikely the copse has such elderly inhabitants. They are one of our native evergreen conifers, favoured by goldcrests and firecrests for nesting because of the dense foliage in which they are clothed. At the top of the copse, the large muddy areas are now covered with chalk rubble to raise the paths, and make a passable route for the park vehicles which need to access the area from time to time. We are very grateful to the Community Payback groups who did such a splendid job of carrying many tons of chalk from the roadside. And for clearing up so well. Over the months the instant chalk effect should lessen as the path weathers and blends into the surrounding vegetation. Covering with wood chip helps of course. As a footnote to one of our previous activities, on the "Clean for The Queen" day, our chair of the committee, Ruth Baxendale, spent the afternoon at the Palace of Westminster, as a guest of Keep Britain Tidy. Several speakers talked about the motivation of volunteer groups, and caring for our green spaces, as a thank you for helping clear the litter from our countryside. It's good to know the friends groups exist across the country sharing the same objectives.